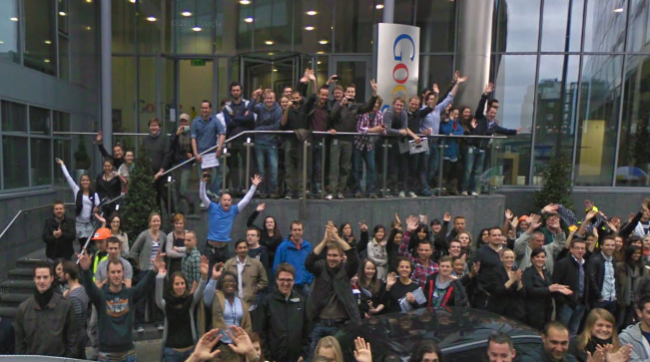 Google is well known as a great place to work and the entire European HQ here in Dublin had a little fun recently when 2,000 of them lined out in the streets to have their photo taken for their own streetview product as the car passed their offices (have a play with the actual street here). The stunt was carried out a couple of months ago and has made its way on to the live version of their maps and street view which means anybody who doesn’t know that their offices are there and just happens to be browsing will be met with over 2,000 mad staff dressed in all sorts of weird outfits holding laptops in the air and promoting their own Google products. It’s a great insight into the cool things that Google does and even though it has only been picked up by a couple of Irish websites (first spotted here) you can be sure that it will start getting a lot of attention around the world and show what a great fun place Google is to work. There have of course been lots of negative reports around street view and plenty of privacy concerns but this is a little way of putting the fun back in to the project and some cheap PR for Google. What I love most about Google as a company is that although they are very serious about taking over the world with their search, social networking and mobile products they always know how to let their hair down and do something a little quirky!